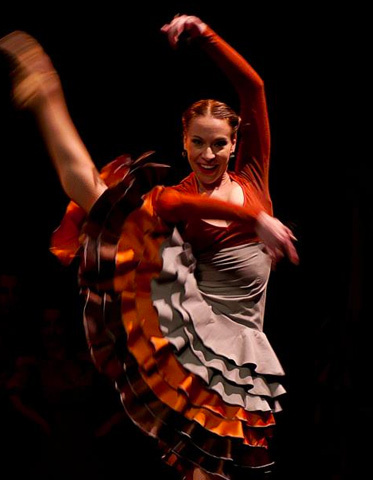 Spanish dance is the most sophisticated form of choreography from the classical music of the grand Spanish authors: Manuel de Falla, Albéniz, Granados, Turina and amany more This form of dance is practiced normally with shoes, castanets, and sometimes with classical ballet shoes. This aesthetic reminds us of flamenco and folklore. In the 19th century, the boleras were known also as Spanish dance or national dance, so they changed some of the musical expressions and dance representatives of nationalist movement of the era. Although, at the same time (, the manifestation experimented with a peculiar mix of Andalusian dances, up until the point that they were synonymous with escuela bolera. Inside their vast and rich spectrum of dances withdistinct regional origins, during the contemporary era flamenco and escuela bolera enriched each other mutually, incorporating numerous steps and movements.